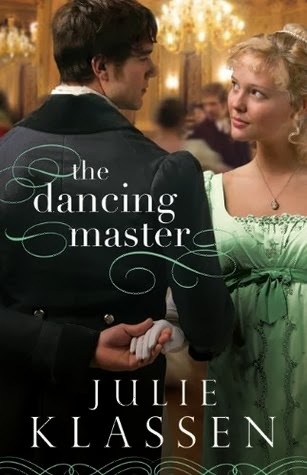 My thoughts: This is, by far, one of my most favorite books and easily the best book by Julie Klassen (that I've read). It definitely is a sort of throwback to Footloose. First, I truly enjoyed the characters. While I would've liked to have known more about Ben and Tess' lives and Miss Patience as well, I really enjoyed the development of Alec, John, Julia and Lady Amelia. The story itself was far from predictable. I was genuinely surprised at several plot twists and turns. And while Julie's work is classified as "Christian fiction," I can tell you that even if you're not a Christian, you will enjoy this tale. It took me a couple of days to get into the story, but once I made it past about page 100, I really could not put the book down. I enjoyed all of the back story included and learning the different dances. One thing I always enjoy about period pieces is reading about the etiquette. Miss Julia's response to Alec when asked for a dance is certainly memorable! Above all, this book is far more than romance. A certain scene that takes place while Alec, Julia and others are riding their horses is enough to break anyone's heart, and it has nothing to do with romance between a man and a woman. Learning of Lady Anne and Lady Amelia's histories gives me fresh resolve to never let the sun set on my anger. In short, this book was inspirational and one I won't forget anytime soon.